All are very welcome to join us for the last melodrama screening session of the term. 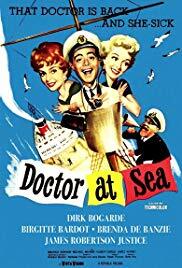 We will be screening Doctor in the House (1954, Ralph Thomas, 92 mins) and/or Doctor at Sea (1955, Ralph Thomas, 93 mins) on Wednesday the 3rd of April, 5-7pm, Jarman 6. Including films from the popular ‘Doctor’ comedy series in our season of Dirk Bogarde melodramas may seem an odd choice. While it would be a stretch to describe the films as melodrama, they are hugely significant to Bogarde’s screen image. Bogarde appears as Simon Sparrow, a medical student in the first instalment, but then a qualified doctor who develops and climbs the career leader as the series progresses – he appears in 4 of the 5 films made between 1954 and 1963 (in 1954, 1955, 1957 and 1963). As well as the cumulative effect of Bogarde appearing in several films, the series, especially the first film, was hugely popular. The BFI’s list of the top 100 films at the UK box office (adjusted for inflation) places Doctor in the House at no. 36, with an estimated audience of 12.2 million, roughly a quarter of the UK population at the time. Bogarde had previously been listed on the trade paper Motion Picture Herald’s survey of the stars which exhibitors through brought in audiences at no.5 (in 1953). But Bogarde ranked higher during the 50s each year he appeared in a Doctor film: no. 2 in 1954, no. 1 in 1955, before dipping to no. 3 in a non-Doctor year, back up to no. 1 in 1957. The ‘Doctor’ films therefore provided audiences with an alternative to some of Bogarde’s darker or more challenging roles which we have screened – such as Cast a Dark Shadow (1955), Libel (1959), Victim (1961), The Singer Not the Song (1961). While the Doctor films have garnered less critical attention, they are arguably more central to Bogarde’s screen image, and especially worthy of our attention. Do join us for these enjoyable films if you can. This entry was posted in Screening and Discussion and tagged BFI, Box Office, Cast a Dark Shadow (1955), Dirk Bogarde, Doctor at Sea (1955), Doctor in the House (1954), Libel (1959), Melodrama, Motion Picture Herald, The Singer Not the Song (1961), Victim (1961) by melodramaresearchgroup. Bookmark the permalink.